Socialisme Ou Barbarie's 1967 theses on Mao and the Chinese revolution. The is an introduction to these theses The Character of the Chinese Revolution 1. When the armies of Mao Tse Tung and of General Chu Teh crossed the Yangtse river in April 1949, the seal of defeat was almost set on the forces of Chiang Kai Shek. His power had collapsed and before the autumn the Kuo Min Tang was to be driven from the mainland. The world started talking of a 'victory for communism' in China. The Kung Tsiang Tang (the KTT or the Chinese Communist Party) was however to characterise its military victory over the Kuo Min Tang as the 'victory of the national bourgeois democratic revolution' which had begun 38 years earlier. What the KTT proposed and what Mao Tse Tung considered his first task-was the 'stimulation of the revolutionary process'. The bourgeois revolution, according to their beliefs, would be followed by the proletarian socialist revolution. At a later stage the 'transition to communism' would be on the agenda. There is a striking resemblance between the ideas of Mao and the KTT on the development of the Chinese revolution, and those of Lenin and the Bolsheviks on the development of the Russian revolution. 13. The outlook of the KMT was as vague as its heterogeneous composition might lead one to expect. It failed to realise that, as in all bourgeois revolutions, the development of China's economy depended on an agrarian reform and on the freeing of the peasantry from feudal forms of ownership. The confusion was inevitable for this freeing of the peasantry was inseparably connected with the breakdown of traditional Chinese family relationships. These relationships were an integral part of the future China envisaged by Sun Yat Sen and the KMT. The KMT were republican nationalists and the logical consequence of nationalism was a struggle against imperialism. But this was impossible for a party whose bourgeois supporters were so strongly linked to that very imperialism. So confused were Sun Yat Sen's ideas that he seriously believed that China could be unified and strong under a central power supported by foreign capital. He failed to realise that such foreign capital benefited most from China's weakness. The main feature of the ideas of Sun Yat Sen and the KMT was, however, their notion of a general reconciliation between classes. This unrealistic ideal incontestably corresponded to the fact that the KMT was the political expression of basically antagonistic interests. 14. It was only in the early twenties, when the Chinese people took action to defend themselves against an oppressive imperialism, that the KMT moved to the left. The party was reorganised and Sun Yat Sen drew up a programme for it which for the first time recognised the agrarian problem as basic to the development of Chinese society. The programme was however so obscured by Confucian terms that hampered its revolutionary interpretation that the left and right wings of the party could interpret it as they chose. Despite this, the KMT was driven by events for a while to fight imperialism and the forces of reaction which had remained as strong as they had been in 1911. For a time it seemed as if a form of 'Jacobin democracy' would appear within the nationalist party. The revolution gained momentum but this only exacerbated the contradictions between the various social groups which composed the KMT. As the revolution moved forward, all that was reactionary within China arose against it. 18. A third party to appear in the Chinese revolution was the Democratic League. Founded in 1941,the League sought from the beginning to act as a buffer between the KMT and the KTT. In the newspaper Ta Kun Puo (January 21 1947), close contacts of the League defined its activities as conducting propaganda for democracy and acting as intermediaries between the KMT and the Bolsheviks with a view to achieving national unity'. Elsewhere the League defines itself as being directed towards the end of civil war and towards peace. The League sought to reconcile the irreconcilable. The compromise put forward (the League themselves used the word 'compromise') was an attempt similar to the one made by Sun Yat Sen in 1912 when he gave way to Yuan Shih Ksi 'to avert a civil war'. But in ]912.the revolution once begun, civil war was inevitable. All attempts to compromise at that stage or later in history only had one result: an intensification of the civil war. 19. It has been said of the Democratic League. founded by the coalition of various groups and small parties, that most of its supporters were academics or students and that they used the word 'democracy' much as it is used in the West. namely to mean the rule of the bourgeoisie. What is true in this characterisation is that these scholars were the heirs to the Mandarins who had ruled China for over 3,000 years but what they had learnt from western bourgeois democrats was but a thin veneer over their basic Confucian philosophy. The basic feature of this philosophy is its concern for 'peace' and the avoidance of class struggle. The Mandarins of the League maintained close economic and family ties with the uppermost stratum of Chinese society. This social layer had one foot in bourgeois society but also maintained feudal interests. This social background was eloquently expressed in the politics of the League; despite its outwardly severe critique of the KMT, its practical actions were confined to attempts at reforming the KMT. Such attempts were fruitless. The 'faults' of the KMT could not have been eliminated without eliminating the social circumstances which had given rise to both the KMT and the Democratic League. 21. In the years 1927 to 1947 the Chinese revolution under- went a second period of stagnation. During this period the KMT was in power, having separated itself from its youth and its own Jacobin wing. This was the Girondin period which had begun with the defeat of Sun Yat Sen and of the left. In the spring of 1927 social antagonisms brought about a political crisis and a subsequent split in the party. In the April of that year there were two KMT governments; a left wing one at Wu Han and a right wing one at Nanking. The differences between them were not great for the Wu Han regime itself was to keep its distance from the peasantry, now becoming active. The Nanking regime reacted in the same way. There was no difference between the agrarian policies of the two regimes. 22. The Nanking government of Chiang proved victorious in the critical year of 1927, great working class uprisings had to be put down in Shanghai and Canton. It is claimed by some that these uprisings were attempts by the Chinese proletariat to influence events in a revolutionary direction. This could not have been the case. Twenty-two years after the massacres in these two towns the Chinese Ministry of Social Affairs announced that in China there were fourteen industrial towns and just over a million industrial workers in a population of between four and five hundred millions-i.e. industrial workers comprised less than 0.25% of the population. In 1927 this figure must have been still lower. With the proletariat insignificant as a class in 1949, it seems unlikely that they could have engaged in revolutionary class activity twenty-two years earlier. The Shanghai uprising of March 1927 was a popular uprising whose aim was to support Chiang Kai-shek's Northern Expedition. The workers only played a significant role in it because Shanghai was China's most industrialised town, where one-third of the Chinese proletariat happened to live. The uprising was 'radical- democratic' rather than proletarian in nature and was bloodily quelled by Chiang Kai-shek because he scorned Jacobinism, not because he feared the proletariat. The so-called 'Canton Commune' was no more than an adventure provoked by the Chinese Bolsheviks in an attempt to bring off what they had already failed to achieve in Wu Han. Chiang Kai-shek was obliged to embark on new roads and was ready to do so. He dreamt of being, if not the Jacobin, at least the Girondin reformer of China, just as Kerensky had dreamt of being the great reformer in the Russian revolution. Kerensky, like a comic opera hero, had strutted across the Russian political scene between February and October 1917, believing he could dominate events, whereas in fact it was events that were carrying him forward. Chiang Kai-shek can be compared to Kerensky in several ways: neither had much criticism to make of imperialism: both were faced with agrarian problems which resulted in the basic instability of their regimes; both became puppets of reaction as a result of their own ideals. Kerensky's 'socialist' beliefs (the word can be interpreted in many ways!) led him to become the ally and friend of many of the most reactionary elements in Russia. Chiang Kai-shek who, as a cadet in the military academy, had dreamt of 'renewing China with his sword' in his own lifetime, eventually became a member of a clique of whom T.V. Soong was the most typical member. But the wealth of Soong* (* in fact, Chang's father-in-law) and other large financiers presupposes both a form of commercial imperialism and the mass poverty of the Chinese peasantry. Kerensky's policies were similarly dictated by the social position of his friends, such as Nekressov, a position based on the poverty of the Russian peasantry. While Kerensky's government in Russia lasted only a few months, the Chinese 'Kerensky' period of the KMT lasted until World War II. 24. Although the accession to power of Chiang Kai-shek impeded the progress of the bourgeois revolution, the revolution had already begun and the main revolutionary force, the mass of the peasantry, continued to press forward. In the early thirties, scarcely three years after the country had been 'pacified', there was a series of peasant insurrections. Thus the KMT armies were fighting against the revolutionaries-the peasantry -who had been continually oppressed and cheated and were now being driven to extremes of desperation. Wherever the masses took action they undertook a general partition of the land. This partition was so radical in the province of Kiangsi that the KMT were forced to legitimate it when they 'pacified' the rebellious area in 1934, although such land reform was scarcely in accord with their general policy. Chiang Kai-shek had declared, it is true, that he intended to regulate land ownership so that each could have his share, but outside Kiangsi where the partition was imposed by peasants themselves no such reforms took place. The KMT claimed that co-operatives would improve the living standards of their participants and, although the number of such co-operatives rose from 5,000 to 15,000 between 1933 and 1936, they only in fact served the interests of the land-owners. The Swedish anthropologist Jan Myrdal, who lived for a time in a country village in Shansi, recorded that the peasants themselves had told him that the credit system brought them further into poverty. Their debts to the landlords increased and the troops of the KMT enforced payment. Such conditions, as recorded by Myrdal, lend weight to the assertion that the revolution which smouldered throughout the thirties to explode in the forties was overwhelmingly a peasant revolution. Here can be found the source of the increasing corruption within the KMT: such corruption was not the result of personal characteristics of the KMT leaders but of the social system itself. The KMT was not corrupted because it sought support from the propertied classes but by the fact that it was based on such classes. This corruption greatly exacerbated the social problems of China. The Nanking government and the parasitical classes which it represented held back development and tended to destroy China's economy. But once this economy was challenged the government itself was doomed. After twenty years of tentative attempts, the peasant masses at last discovered how to unite in a revolutionary force. It was not the working class, still very weak, which brought about the downfall of Chiang Kai-shek but the peasant masses, organised under primitive democracy into guerilla armies. This demonstrates another fundamental difference between the Chinese and Russian revolutions. In the latter the workers were at the head of events at Petrograd, Moscow and Kronstadt, and the revolution progressed outward from the towns into the countryside. In China the opposite was the case. The revolution moved from rural to urban areas. When Kerensky called upon the army to help him against revolutionary Petrograd, his soldiers fraternised with the Bolsheviks. But when the armies of Mao Tse Tung and Lin Piao approached the Yangtse river, the peasant soldiers of the KMT deserted en masse. There was no question of a defence of Nanking or of the China of Chiang Kai-shek. The spectre of feudalism was driven out of China and capitalism was bloodily born there, the result of a social caesarean section carried out with the bayonets of peasant armies. The ink was scarcely dry, however, when the peasants of Honan challenged such opinions with an irresistible force. Deeply impressed by what he had seen during a short visit to his native province, Mao Tse Tung came to believe that it was not the workers but the peasants who would be at the forefront of the revolution. He wrote in a report that, 'without the poor peasants there can be no question of a revolution'. Whoever acted against the peasants attacked the revolution; their revolutionary tactics were beyond reproach. 28. Mao Tse Tung depicted in great detail the revolutionary tactics of the peasants of Honan in a report on the revolutionary movement in that province. These tactics were used throughout China as much during the long'Kerensky period' as in 1949 and in 1953. The houses of village tyrants were invaded by crowds, their corn confiscated and their pigs slaughtered. Landowners were dressed up as clowns and paraded through the villages as prisoners; meetings were held at which the poor expressed their grievances against the rich, and tribunals were set up to try exploiters. These were the methods of struggle spontaneously developed by the Chinese peasants. In China, just as in Russia, it was not the party which showed the way to the peasants-the peasants showed the way to the party. 29. The social changes which occurred in the Chinese countryside between 1949 and 1953 were characterised by partition of the land, the dispossession of the landowners, the breaking up of the social groups connected with them and, finally, by the destruction of the patriarchal family which was the basic production unit of traditional Chinese society. The social significance of this process was that it put an end to the old system which was in decline and seriously hindered the development towards private ownership of land (the most important means of production in China). The result was the same in China as it had been in Russia. Those who had been landless peasants became small land-owners. After four years of agrarian revolution, there were between 120 and 130 million independent peasants in China. 31. Partition of the land created, both in Russia and China, the conditions under which agriculture could enter the sphere of modern commodity production. Such a system of commodity production arose in Western Europe under the form of classical capitalism. In such a system there no longer exist the closed units in which needs are fulfilled by local labour alone and in which production is geared to local consumption. A peasant no longer consumed all his own production nor produced for the satisfaction of all his own needs. Specialisation developed and the peasant began to work for the market just as industry did. The peasant supplied industry with primary products and the non-agrarian industrial workers with food. In return, industry supplied the peasant with the machinery to improve and increase production. This specialisation led to an increasing inter-dependence between agriculture and industry. In Russia and China this type of development also took place, but not along classical lines. Both these countries lacked a modern bourgeoisie which is the historical agent of this type of social change. Its historical role had been taken over by the party and the state. The development towards capitalism in these two countries was also the development towards state capitalism. At first it might appear as if this development was the product of a supposedly 'socialist ideology. On closer inspection, however, it appears that state capitalism was not the result of such an ideology but rather that this 'socialist' ideology was the consequence of the new inevitability of state capitalism. While the Russian proletariat were developing new methods of struggle, the Chinese proletariat were resorting to the classical strike weapon. But in both countries legislation was directed at the self-activity of the workers. Behind the thin facade of the so-called 'dictatorship of the proletariat' could be found, in both countries, the features of capitalism. 34. In both China and Russia there was a contradiction between the claims of the Bolshevik Party and social reality. In relation to the trade unions, this led to a 'discussion' in which the truth was meticulously avoided even when the facts were fairly clear. 44. In 1957 while the seed of the 'Hundred Flowers' was germinating in the fertile soil of the existing social relations, the Party replied to criticism by a sharp campaign against 'right-wing deviationists' which lasted until April 1958. Then in the summer of that year, the Party announced its policy of the 'Three Red Flags' which it had been preparing for some months. -The first 'red flag' was the 'general policy of socialist construction: the joint development of industry and agriculture by the simultaneous utilisation of modern and traditional productive methods. -The second 'red flag' was the 'great leap forward': the attempt vastly to increase the production of steel and power. -The third 'red flag' was the formation of 'peoples' communes' throughout the countryside as the second phase of agrarian collectivisation. From this it can be seen that after the short 'Hundred Flowers' period the Party continues on its state capitalist course more decisively than ever. China was now at the stage that Stalin's Russia had reached in 1928, eleven years after the Bolshevik revolution. China had taken nine years to reach this stage. Her development had been more rapid and the methods used more radical. Such 'progress' however was not achieved without trouble. When towards the end of 1958 the 'weapon of critique' of the 'Hundred Flowers' period was discarded and the peasants took the road of a 'critique by weapons', the Party had to back-pedal. In December 1958, April 1959, and on several subsequent occasions, the Party had to modify its 'Communes' programme before eventually abandoning it in 1962. A similar fate met the other two 'red flags'. In the spring of 1962 the policy of the 'Three Red Flags' was completely abandoned. The concept according to which the 'political power of the proletariat must be used to win victory in the cultural field' is based on a fundamental misunderstanding of the link between relations of production on the one hand and political and cultural relations on the other. These wrong ideas arose from the fact that the respective roles of the social and economic infrastructure of society and of its political and cultural superstructure were reversed. Cultural and economic changes are not brought about by the instrument of politics but come about when the economic foundations of society are being transformed. The opposite is learnt if-as is the case of Russia and China-reality too is violated and wage-slavery is presented as the opposite of what it really is. The 'Great Socialist Cultural Revolution', we would stress, had nothing to do with socialism. Nor was it in any real sense a revolution. 50. The Party's tame critics claimed that writers such as Wu Han, Liao Mo Sha, and Teng To 'wanted to restore capitalism' in China. Such an accusation slots into the jargon of Bolshevik ideology but is patently absurd. Capitalism being the existing economic system, there was no need to 'restore' it. What was at most possible was that some Chinese preferred traditional liberal capitalism to the state capitalism variant which existed in China. Who then were the critics? Classical capitalism had made little headway in China and the embryonic classical bourgeoisie had been destroyed or exiled in the late forties. Its residual representatives are today to be found in Formosa or elsewhere. In the unlikely event that there are people in China who favour a return to the social relations of classical private capitalism, Teng To, Liao Mo Sha and Wu Han are not amongst them. While their enemies within the Party constantly publish long attacks on the works of these writers to prove their hostility to the current regime, nowhere in the quotes does any hostility appear towards the system of state capitalism. It is true that Three Family Village (the joint work of these three pilloried authors) contains a semi-overt attack on the 'people's communes', but these criticisms are neither of state capitalism nor of the Party, which was in fact itself now abandoning the 'communes' policy. 52. 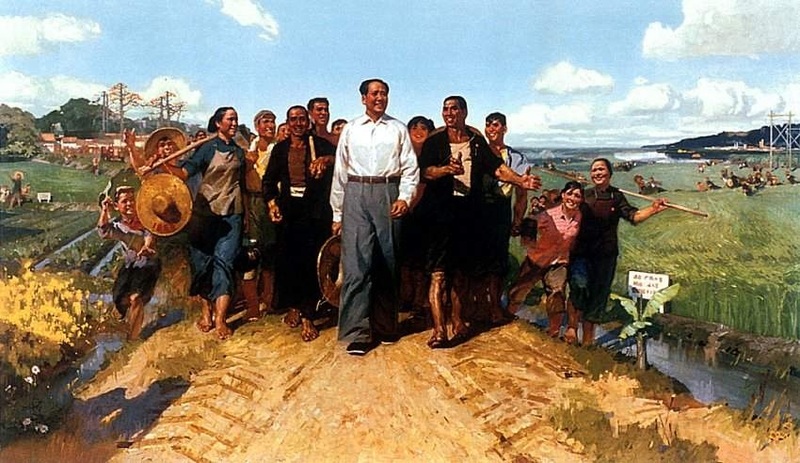 In China the 'Great Socialist Cultural Revolution' was nothing more than an attempted self-defence by the Party against the increasing pressure of the 'new class'. Against the literary attacks of Teng To, Liao Mo Sha, Wu Han and others, the Party at first used purely literary weapons. The 'Thoughts of Chairman Mao' were published in the famous 'little red book' in which are contained Mao's pronouncements on art and literature uttered at Yenan in May 1942. When Mao said, in the forties, that 'writers must place themselves on the Party platform and must conform to Party policies', he meant something rather different than the use that was to be made of this phrase some twenty years later. When the 'new class' changed its weapons the Party followed suit. The literary conflict between the 'new class' and the Party developed into a physical struggle. The stake in this struggle was just as obvious as in the previous literary phase. But there was a difference. Reality could be ignored on paper; in real life it could not. The 'new class' in China was a product of social development, just as it had been in Russia, and as such the Party felt obliged to defend it. This explains why, at a certain stage, Lin Piao had to hold back the Red Guards and why Mao Tse Tung himself had to call a halt to the 'Cultural Revolution'. What was at stake then was neither literature nor cultural affairs but production and the Chinese economy. From all that precedes, Mao's opponents give the impression of being a group with roots in industrial life and including many Party officials. They have financial influence and are in a position to allocate the products of industry (both food and other commodities). They have the power to grant wage increases and other social advantages. They can therefore be characterised as managers. 54. The clearer the picture of Mao's opponents becomes, the more readily are they identifiable as the 'new class'. The real social differences between them and the Party correspond exactly to the theoretical differences between Wu Han and Teng To on the one hand and the Party on the other. It is no coincidence that in the early sixties Wu Han was not only an author but also assistant mayor of the large industrial town of Shanghai. Neither is it a coincidence that in the mid-sixties the mayor of Shanghai was one of those fighting the Party with more than a pen. Their so-called 'economism' was the atmosphere they encountered every day in the industrial climate of Shanghai. 56. In Russia the traditional, old style Party and the 'new class' were natural enemies. This was not the case in China where, because the proletariat had always been weak, the Party had not been forced to pay as much heed to the workers as had its Russian counterpart. As a result the Chinese Party had a freer hand. Its policies were more drastic and direct (see Thesis 35). It moved faster and more confidently towards state capitalism. This is why the Chinese Party differed from its Russian counterpart and why in China the borderlines between the Party and the 'new class' are less easy to discern. Mao's opponents are so strong, even within the Party itself, that at an Executive Conference held early in 1967 only six of the eleven present supported Mao. In Russia the 'new class' came to power imperceptibly, the traditional Party having proved an anachronism. In China the rise of the 'new class' has been associated with struggle for control of the Party. 58. We have sought to analyse the social characteristics of Mao's opponents, but we hope it will be realised that every detail cannot be fitted into this analytical framework. Information leaking out of China concerning battles between Red Guards and workers for the control of several factories in Manchuria confirms no doubt that the 'Proletarian Cultural Revolution' was neither proletarian nor a revolution. But no one will assert. we hope, that the workers who fought Mao's Red Guards were managers or members of the 'new class'. One does not think of the managers either when one looks at the 1967 uprising against Mao Tse Tung in the capital city of Kiangsi province. The movement took the name 'The First of August Movement' in reference to the time, forty years earlier, when organisations were briefly formed in that part of China on the model of workers' councils, these had played a part in the conflict between the left and right wings of the Kuo Min Tang. Still more difficult to place is the Chinese head of state, Liu Shao Chi who, even within the Party, had always held an independent position. The Maoists of the 'cultural revolution' call him their enemy, but Liu himself takes care to distinguish himself from all other opponents of Mao. It is obvious that many different developments are occurring simultaneously in China. But although reality is more complex than any abstract schema, the exceptions do not contradict the rule. Whatever the forces may have been against which the Red Guards and the 'cultural revolution' were unleashed, the situation can only be understood by the appearance on the scene of the 'new class', with its own indisputable claims.